This is the golden beetle that took refuge on my head during the bad haze days in June 2013. This is the golden beetle that DinoBoy decided to have as a pet and kept him in a small bucket. 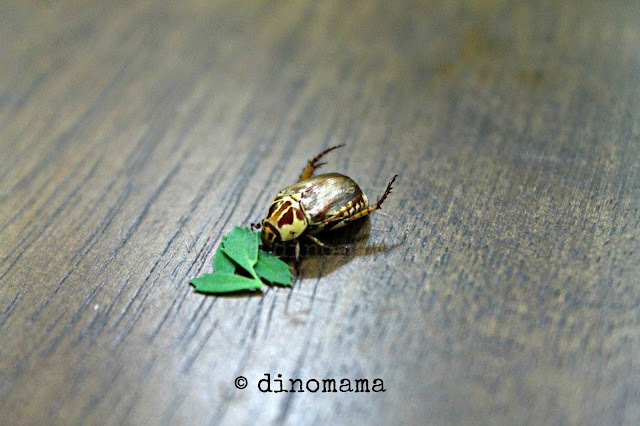 This is the golden beetle that DinoBoy diligently supplied it with fresh marigold leaves as food every day. This is the golden beetle that died (R.I.P.) about two weeks later; reason unknown. This is the golden beetle that took DinoBoy 2 weeks to finally accept that it is dead and the body thrown away. This is our First Pet Golden Beetle. *Photo taken with my Canon EOS, kit lens with macro function. ah that is so cute. My youngest daughter is the same way she brings in ladybugs all the time. It does not seem right to keep these bugs in a container but how can I tell him that when he begged me? Anyway, I am sure this will be the first and last pet bug after he sees they are so fragile. Awww, your poor son! Harsh lesson for a child. Cute photo though. Well, its not his first lost, no tears shed. He did cry when his first pet hamster died, he was the one who discovered it as he went to meet and greet tt furry little fella every morning. Thanks Dom~ No WW post today from u? I just loved the way you wrote it! It just flow out of me when I typed in the first sentence =) So glad that you love it. creepy yet pretty to look at! Its beautiful, golden and shiny but ya... a little bit creepy. Especially when my son found it in my hair! Hahah~ its really a beautiful beetle.